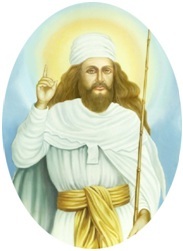 Asho Zarathushtra (Zoroaster to the Greeks), prophet of the world’s oldest revealed religion, lived in remote antiquity, sometime around the dawn of the Iranian bronze age, circa 1,800 – 1,100 BCE. His place of birth was in the ancient land of Airyana Vaeja in Central Asia, possibly somewhere around the Aral Sea. In his thirtieth year, Asho (righteous) Zarathushtra received the revelation and started on his mission to bring His message to mankind. One of Zarathushtra’s first disciples was King Vistaspa, ruler of Bactria. Thereafter, the religion spread far and wide. 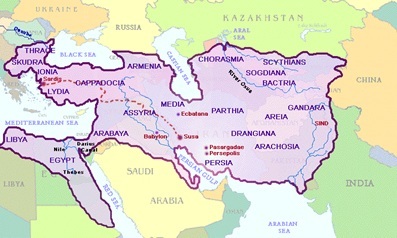 For a thousand years (559 BCE to 651 CE) it was the dominant religion during three mighty Persian empires that stretched west towards Rome and Greece, east into India, north into Russia and south into Egypt, with followers in the millions. Despite having lived in India for over a thousand years, the Parsis have maintained their religious identity, primarily because they did not proselytize. Over the centuries they have assimilated three separate cultures – the ancient Persian, the Indian and the Western. A miniscule minority in India (less than .01% of the population), the Parsis have influenced the country well out of proportion to their numbers. Enterprising, highly literate and reputed for their honesty, they occupy a position of distinction in the business community. Under British rule in the 19th century, the Parsis became the earliest Indian industrialists and built the first great Indian industrial projects – ship building, aviation, steel, textiles, chemicals, nuclear energy, and have excelled in the arts and sciences. Noted for their integrity, philanthropy and pioneering spirit, they have founded hospitals, schools and other institutions, liberally extending their philanthropy beyond their own community. But the religion is not ready to be relegated to the history books just yet. It is perhaps its core beliefs that impel its followers to excel in all areas of human endeavor and contribute for the benefit of humankind. There has been a strong awakening in recent years. In North America, there are now eight Zoroastrian temples, twenty-four associations and one North America federation (FEZANA), providing a strong communal infrastructure. Zoroastrian presence is increasingly evident in the interfaith arena, helping to restore the religion to its rightful place as a venerable and living member of the world’s religious family. Zarathushtra presents a view of the world in which Ahura Mazda originally creates an ideal existence in accordance with the Law of Asha. As the world progresses there is conflict between the forces of Good (Spenta Mainyu) and Evil (Anghra Mainyu). In this cosmic drama, man is not a bystander, but rather, the prime agent through whose actions the ultimate triumph of good over evil is assured. Ahura Mazda gives man not only the freedom to choose between good and evil, but also the responsibility to actively promote good and vanquish evil. Through the collective good acts of humanity, the world evolves towards the final resurrection (Frashokereti), when all will be in a state of perfection (Haurvatat) and everlasting bliss (Ameratat). 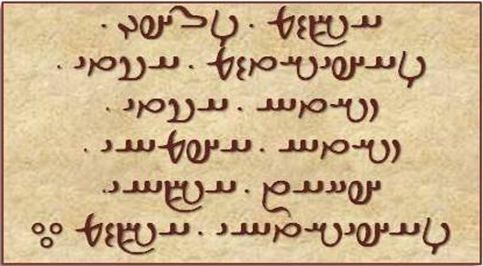 The corpus of Zoroastrian sacred literature is known as the Avesta, written in the ancient Avestan language. It comprises of: the Yasna, the central ritual of worship, within which are preserved the Gathas – divinely inspired and revealed poetry composed by the prophet himself; the Visperad (minor liturgical works); the Vendidad (priestly code of protection); and the Khordeh Avesta (collection of prayers for the laity including the daily Kushti prayers, Niyayesh and Yasht devotional invocations and Nirang incantations). A mobed (priest) tends the Fire. 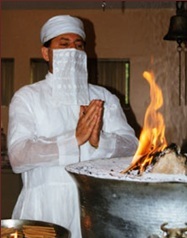 Zoroastrian rituals and prayers are solemnized in the presence of a Fire, which is scrupulously tended with sandalwood and frankincense and kept burning in a silver urn in the inner sanctum of every Zoroastrian ‘fire-temple’ also called a ‘Darbe Mehr’ (house of divine light). Fire is revered as a visible symbol of the Inner Light, the divine spark, that burns in each and every heart; a physical representation of the Illumined Mind, Enlightenment and Truth. It is important to note that Zoroastrians do not “worship fire,” as the religion denounces the worship of any idols or deities. A child is officially initiated into the Zoroastrian faith with the Navjote ceremony, at which time he or she is invested with the sacred Sudreh and Kushti. The Sudreh is an undershirt of white muslin with a symbolic pocket in front reminding the wearer to fill it every day with Good Thoughts. Good Words and Good Deeds. The Kushti, a woolen cord, signifies that the wearer has girded him or herself to fight evil. The child henceforth pledges to steadfastly follow the teachings of Zarathushtra, and to reaffirm his/her faith with the Kushti ritual every day. Marriage is a pious duty, a religious sacrament, a holy union of two souls, and not just a social or legal contract. The marriage pact, based on sharing, devotion, faithfulness and self-sacrifice, is considered irrevocable. A wedding is a time of great rejoicing, with feasting and dancing in the company of family and friends. At the ceremony, the priests recite passages from the Avesta, offering affirmations, admonitions and benedictions, while showering the couple with rice and rose petals. Death is viewed as a transformation, a time of passing of the spiritual elements from the physical body. It is one’s soul that chooses between good and evil in this life; and it is the soul that is responsible for these actions and gets rewarded (in heaven) or retribution (in hell) after death. Ultimately, Evil shall be vanquished by Good, and all souls will be raised in a blissful state, (Frashokereti). Upon death, extensive prayers and rituals are performed, to ensure a safe passage of the soul into the spiritual realm. The Greeks, who studied the philosophy of the Persian prophet, dating him “5,000 years before the Siege of Troy” [Plutarch], mistranslated his name as ‘Zoroaster’. His doctrine is mentioned by Greek writers Plato, Socrates and Aristotle, who studied under the Magi (Zarathushti priests) of their times. During the Achaemenian Persian period, a number of books circulated through the Greek world in the name of Zoroaster to lend them authority. 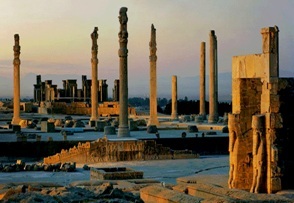 The long saga of the wars between the Greeks and the Persians is recorded in Herodotus’ History (5th century BCE). The commemoration of December 25th as the birthday of Christ has its origins in early Mithraic observances. This was the date of a Roman festival to celebrate natalis solis invicti, the “birthday of the unconquered Sun,” which, following the winter solstice, once again begins to show an increase in light. Around 336 CE, the church in Rome established the commemoration of the birthday of Christ on this same date. 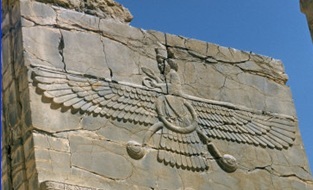 Zoroastrians had a belief in the coming of a savior, born of a virgin mother, who would bring the revelation from God. 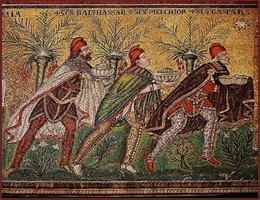 It is of interest to note that the Three Wise Men (magi) who heralded the infant Christ were Zoroastrian priests. To this day, frankincense and myrrh are offered at the altars of Zoroastrian fire temples. Having come from the same Indo-Iranian roots, in remote antiquity, Hindus and ancient Persians shared a common pre-Zarathushti Mazdayasni faith. They practiced reverence for the fire and other natural elements. Both, in the Zarathushti Avesta and in the Hindu Vedic hymns, Mithra (Mitra) is invoked as the Lord of Heavenly Light. The Avesta language of the Gathic scriptures and Sanskrit of the Vedas originated from the same Indo-Iranian philological family and bear some striking similarities. The Zarathushti belief of the world moving towards perfection (haurvatat) and the final renovation (frashokereti) is very well explained in the Upanishads of the Hindus. In the Vedas the word Rita has the same significance (truth, righteousness) as the word Asha in the Avesta. After the Islamic conquest of ancient Persia (Iran) a group of Zarathushtis migrated to India in search of a safe haven to practice their religion without the fear of persecution. After a millennium of living in Hindu India, a number of ceremonial aspects of Hindu culture have been integrated into the Parsi Zarathushti tradition. The Hindu concept of reincarnation (one soul entering innumerable different bodies) and Zarathushti resurrection (the same soul re-uniting with the same body at the end of time) are incompatible. Through detachment and renunciation of this corporeal world or body, the Hindu strives to escape from the cycle of birth, life and death so the soul may be freed to ultimately become one with the Absolute. To a Zarathushti, however, life is to be lived to the fullest in this world. One seeks salvation through an ethic of personal responsibility. Every good thought, word and action of a person furthers, cumulatively, the cosmic goal of moving towards frashokereti.